After inspecting a controversial rocky quarrying site in Karen State, a delegation of state-level officials plans to recommend the government suspend the deleterious activity and terminate existing licenses. Karen State’s Pa-O Affairs Minister Khun Myo Tint and state Hluttaw MP U Min Ko Khaing conducted a field visit to Taung Kalay Mountain in Hpa-an township at the end of last month, following locals’ complaints. Residents from Kawt Yin and Naung Kyan village groups submitted a letter to the president and to parliament requesting authorities halt rock quarrying on the mountain as the activity was disrupting their livelihoods and polluting the environment. Among the two rock quarrying business owners operating on the mountain, one owner’s lisence has reportedly expired. The other business owner’s license remains valid, but the delegation recommended all rock quarrying be terminated regardless, due to objections from the local residents. The two business operators have been running rock quarrying mines on the eastern side of Taung Kalay Mountain. Residents complain that blasts from the mines have damaged their farmland at the foothill of the mountain. 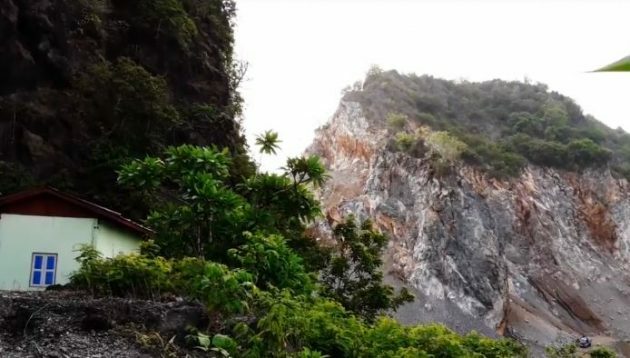 The explosions have also cause local ire after damaging the Thida Aye Cave Monastery and Buddha statues on the mountain, as the delegation saw firsthand. “I showed the situation to the delegation. I explained to them about how residents are unable to farm due to the rocks which fall on the farmland from the mine blasts,” said U Wareinda, the chief monk of Thida Aye Cave Monastery on Taung Kalay Mountain. Despite the delegation’s September 30 visit, the mining has continued, according to the monk. “Rock quarrying is still being carried out on the western side of the mountain. The remaining rocks from the eastern side of the mountain are being carried away with vehicles,” he said.